Ohio has an exotic animal problem. Yep, they still have problems, even after Zanesville and the so-called revamping of laws addressing exotic animal ownership. Tiger Ridge Exotics owner Kenny Hetrick failed to file for a permit in a timely manner. State agriculture department inspectors also found safety problems, including inadequate fencing and hazards that could harm the animals. So after repeated warnings, the state’s agriculture department went and removed the animals. But Judge Reeve Kelsey has ordered the state agriculture department to return the animals to Hetrick. 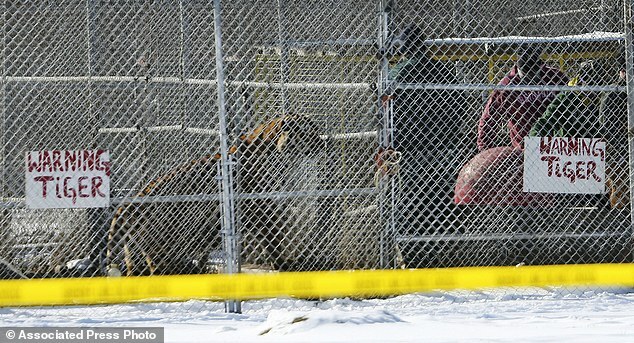 The black leopard, lion, Kodiak bear, liger, bobcat, wolf hybrid, and 5 tigers had been tranquilized and were in transit, so now the agriculture department has to make sure the animals are OK, then return them to a man who had blatantly refused for two years to follow state law and maintain the animals under the conditions set aside after Zanesville. I have to say that I don’t believe ANYONE has the right to own exotic animals. Period. I don’t think they belong in zoos. I certainly don’t believe they should kept as pets or as roadside attractions. And yet, states like Ohio, Florida, and Alabama, among others, allow this practice to continue. Hetrick’s place isn’t a sanctuary. 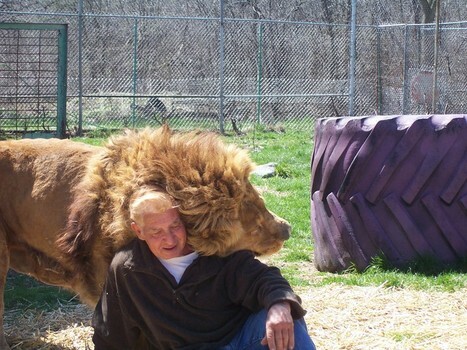 He’s a breeder of these animals as well. You can look on his website and see that. Thanks to Judge Kelsey, these animals will languish still longer while awaiting a court hearing on February 10th. In the meantime, well-meaning but foolish people who see Hetrick as a hero for “facing down the government” are helping spruce up the property, so odds are Hetrick will win the right to keep those creatures. But the people won’t hang around for long, and the conditions will again deteriorate. What do you think? Should people be allowed to own exotic animals? Why or why not? I understand you feeling about zoos, but some of them are where they do their utmost to breed enough of a population to keep the species alive. Many of these are not zoos in the traditional sense. They are dedicated facilities trying to fight the loss of of wildlife. Otherwise, I totally agree. No private party has any reason or any right to own these wild creatures. If a species cannot survive without a zoo’s help, should we keep the species alive? I think in theory they may try to do good, but their work allows us to overlook our bad behavior. I’m with you with the caveat if zoos are helping endangered animals or doing good for the animal first. If it takes a zoo to keep a species alive, then is it fair to the species to keep them in captivity? Zoos don’t release animals into the wild. I’m leaning on the side of no to private ownership of exotic animals unless, as Marilyn mentioned, it’s a regulated, frequently inspected organization truly attempting to preserve a species survival or give respite to animals like retired circus elephants and the like. Where exotic animals REALLY belong is in their natural habitat but with the activities of human beings destroying their habitats….sigh. I have no beef with true sanctuaries who, like you said, take in animals that were used and abused for human amusement and profit, then are given a shot at a decent end of life. But if we didn’t allow the bad actors to have animals in the first place, we wouldn’t need sanctuaries, would we? Is that judge elected or appointed? Exotic animals are supposed to be brought up in this state’ next legislative session. Good to be alert and let people/representative know how you(sanely and respectfully) feel. I hope you get a good strong law passed. Are you working with HSUS to lobby on behalf of animals? I do that here in Florida. I keep an exotic animal as a pet. My cockatoo Leo is from many generations of captive birds but he lives a better life with me than he would scrounging for trash or being netted and gassed as a pest to crops in his home region. I truly believe he isn’t lacking in quality of life by being my companion. But I don’t feel that is true of an animal like a Kodiak Bear that is meant to have an amazingly varied diet and a large territory. Like the rest of the the commenters have said, the welfare of the animals should be considered above all else. Our versions of playing god have almost always backfired. Look at what fish hatcheries have done in actually destroying wild fish populations! Not all captive exotic animals have a life as good as my cockatoo and for that I regularly weep. But because I love my cockatoo and work so hard to give him a good life I can’t say that the keeping of all exotic animals is bad. I don’t think that people should be allowed to own exotic animals because it would make those animal’s lives get shorter…..To own them seems to be human’s ego…..their home is nature….wild life gives them much more energies….humans shouldn’t control it…. Did you look into this at all? The anamals have never been in the wild. He saved them from a circus that was abusing them. Kenny also had EVERY animal fixed. Also – Keep this in mind. He got them 30 years ago! So, not only have they NEVER been in the wild, but they are also VERY old. Also, fyi, he did everything the state requested of him and even more. I do not feel it is appropriate for people to keep exotic animals as pets. They do belong in the wild, but as a species we are very greedy about space, taking more and more habitat. So sometimes a well run zoo, or sanctuary is the only viable option until we see sense and remember we should share the planet. And need lots of care, space, and food. Came and cut fences and broke locks. From bad diets to cubs not wanted anymore. We hope no one gets hurt because of these exotic animals! You are a breeder or marketer for exotic animals? Either way, shame on you.